This self-contained system is ideal for monitoring multiple points on pumps, gear boxes, fans, blowers or turbine/generator sets and protecting this machinery from the potential damages of high vibrations. The 6800 series machinery protection and condition monitoring system accepts from two to eight signal inputs and provides a discrete conditioned level indication for each channel. This self-contained system is ideal for monitoring multiple points on pumps, gear boxes, fans, blowers or turbine/generator sets and protecting this machinery from the potential damages of high vibrations. Each independent channel is per-configured to accept a velocity sensor, acceleration sensor or non-contact displacement probe. These signals are then filtered and conditioned to the desired output units for display and alarm triggering. 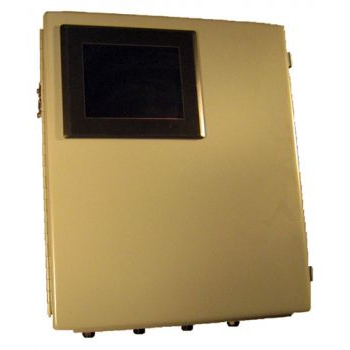 The system includes a high-resolution full color touchscreen display as its operator interface for all programmable features including: warning and shutdown alarm setup and interaction, startup and delay functions, channel interrogation and snapshot trend display. Each alarm limit set points are clearly visible on the run mode display. Acknowledgment of alarms is made via the touchscreen or remote reset option. The standard run mode display includes individual bar graphs for each channel, indicating the current vibration levels as well as visual notification of any alarm states. While the 6800 is designed as an easy to implement standalone protection system, the optional Ethernet communication allows the user to interact with the system via a PC anywhere an Internet connection is available. The 6800 series condition monitoring system is a powerful and efficient tool for protecting your valuable machinery assets.